Have you ever tried fattoush? 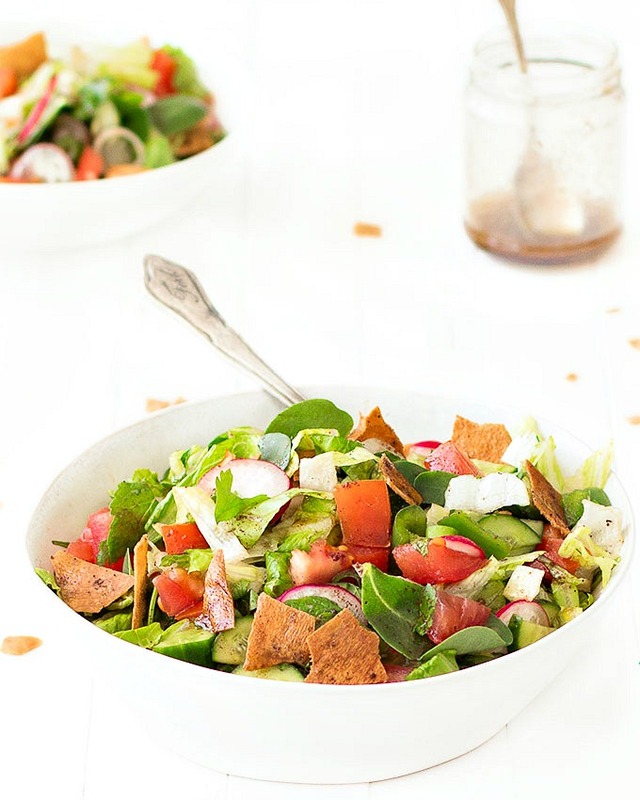 Fattoush is a traditional Lebanese salad, colorful, refreshing, crunchy and full of flavor. It’s simply made with coarsely chopped vegetables and herbs, toasted or fried Arabic bread and a sweet-tangy dressing. Sumac, a deep red spice with a lemony flavor, is a key ingredient. It’s sprinkled over the salad and bread before toasting, and used in the dressing. Sumac powder is available in Middle Eastern markets, in the spice aisle of some grocery stores and you can also buy it online. Let’s talk about pomegranate molasses and purslane. Pomegranate molasses is a thick, dark brown syrup with a sweet and sour tang. Purslane is an herb similar to watercress. If you can’t get your hands on these ingredients, don’t worry. You can still make a great fattoush even without them. Arabic Bread is like pita bread but slightly thinner. You can either deep fried it or brush it with olive oil, sprinkle with sumac and bake for 5 minutes. Remember don’t add the toasted bread to the salad until you are about to serve it or else it will soak up the liquid and become soggy. Fattoush, a traditional Lebanese salad, is a delicious combination of fresh veggies, a bright citrus dressing, herbs and toasted pita bread. 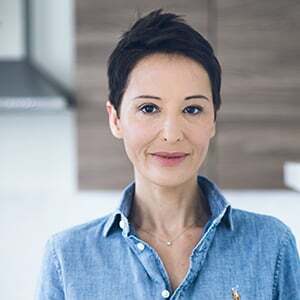 With a scissor, cut the Arabic bread into 4 pieces and split them in half. Brush each wedge with extra virgin olive oil, sprinkle with sumac powder and toast them in the oven at 180 degrees C (375 degrees F) for 5 minutes or until they are light brown. Put aside. Chop all the vegetables and herbs and place them in a large bowl. Prepare the dressing.Take a small glass jar with a lid and combine all the ingredients. Put the lid on and shake the jar until all the ingredients are well-blended. Pour the dressing on the salad and toss lightly. Crash the toasted bread with your hands, add it to the salad and mix again gently. 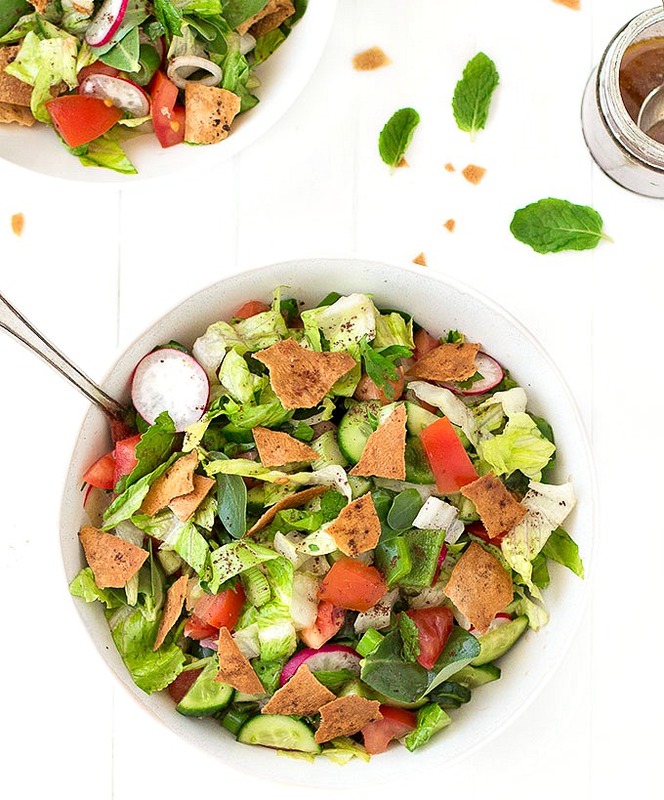 Sprinkle the fattoush salad with sumac powder (optional) and serve! Mmm, I love crunchy salad. 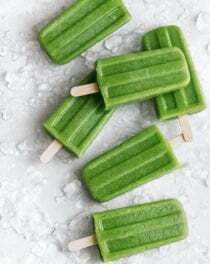 This looks really delicious. I love a great salad and I’ve never tried fattoush! Obviously that needs to change!!! I have never tried this salad and it’s about time I do as this looks so deliciously good! I adore fattoush and your version looks amazing! 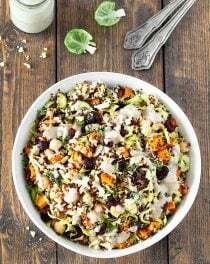 Love the idea of pomegranate molasses in the dressing! Great job Elena. 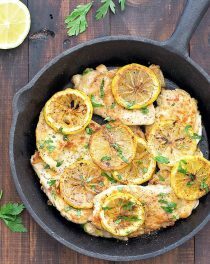 We had published this recipe when we “traveled” through Lebanon. My personal touch (even though it is not traditional) is to add tahini to the dressing. Lovely refreshing summer salad! Thank you for this refreshing and very tasty Mediterranean salad. 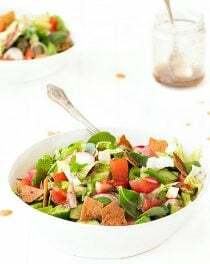 Fattoush is one of my favorite Lebanese dishes. I am sure that anyone who tries this recipe will love it. I’m Lebanese and lived in Lebanon for 9 years, this recipe is on point, except I’d double the dressing 😉 but thank you A+!